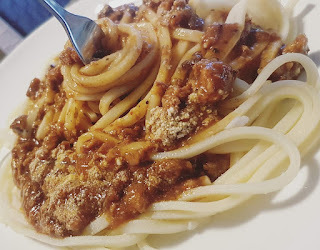 This sauce is similar to bolognese sauce. It's great in combination with mashed potatoes or pasta. And I always make it differently since I never use recipe. If I have tomatoes, then I first mash them in a blender and use them. If I don't have tomatoes, I use tomato sauce from the store. Pick a good one. So this is the basic recipe and it's quite simple and easy. And very very tasty. First finely chop onion and fry. Add the minced meat and fry it well together with the onion. 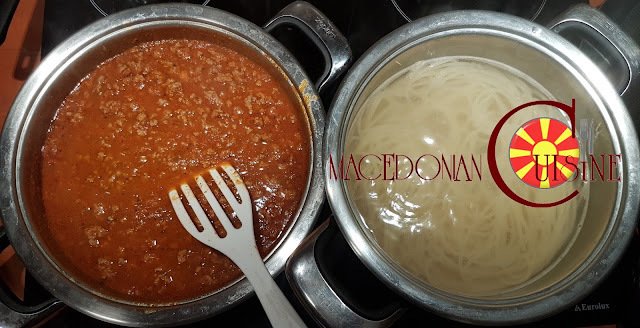 After meat changes colour, add the tomato sauce, wine and all spices and mix well. Check if it needs more salt. The tomato sauce I use contains salt, so I only add a little vegeta. Add more or less spices. So let this simmer for 30 minutes. If it's too thick, add a little water. Add fresh chopped parsley when it's ready. Remove the bay leaf.